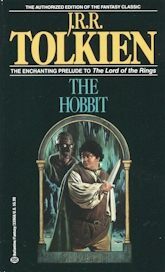 I was first introduced to Tolkien’s The Hobbit when I was a pre-teen. At that point I was not familiar with The Hobbit or The Lord of the Rings trilogy (the movies had not yet premiered). I had the joy and privilege to experience this story with a blank slate, knowing nothing about the book besides the cover image. Thus I was immediately whisked away into the magic of the Shire, Mirkwood, the Lonely Mountain, and Bilbo’s adventures with his “Unexpected Party” of dwarves. To my great relief upon completing the book, I discovered that The Hobbit was only the prequel (though it was not originally written with the intention of being a prequel) to the much grander and epic The Lord of the Rings, and soon after I dived right on in to that as well. Few worlds have captured my imagination and inner longings like Middle Earth. Perhaps I could add Narnia (I have probably read that whole series ten times or more), Hogwarts, and the Fairy Land of Phantastes. I am being very serious when I describe my experiences in these worlds as mystical. It was not merely a matter of entering a great story–I entered into a new reality of wonder. It was not merely escapism–I began to see the magic of my world in new ways (what Tolkien would call “Recovery,” discussed below). Great imaginative writers have written detailed apologias defending the power of fairy literature. Stories and worlds such as those I’ve already mentioned have unfortunately been quickly dismissed into genre fiction: fantasy. It is almost never critically viewed as serious literature. But its importance is far greater than just another pop-novel category. At least it will be plain that in my opinion fairy-stories should not be specially associated with children. They are associated with them: naturally, because children are human and fairy-stories are a natural human taste (though not necessarily a universal one); accidentally, because fairy-stories are a large part of the literary lumber that in latter-day Europe has been stuffed away in attics; unnaturally, because of erroneous sentiment about children, a sentiment that seems to increase with the decline in children. catastrophe, the sudden joyous “turn” (for there is no true end to any fairy-tale)…” I’m reminded of Gandalf’s eucatastrophic appearance at Helm’s Deep when it seemed that all would be lost. Tolkien, however, goes further, and here his Catholic Christianity is very evident. Consolation envisions the fulfillment of the Christian’s longing: paradise, the new heavens and new earth provided only by the eucatastrophic death and resurrection of the Christ. Thus, I hope it is evident that fantasy, true and good fantasy, is something much deeper than a superficial pop-novel. By creating a secondary world of imagination and magic (if you will), it plays out consistently the deepest human and universal themes of the primary world. I also read The Hobbit before it was ‘a thing’. I absolutely loved it!